This article is about the Temptations song. For the Chilliwack song, see My Girl (Gone, Gone, Gone). 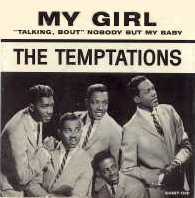 "(Talking 'Bout) Nobody But My Baby"
The recorded version of "My Girl" was the first Temptations single to feature David Ruffin on lead vocals. Previously, Eddie Kendricks and Paul Williams had performed most of the group's lead vocals, and Ruffin had joined the group as a replacement for former Temptation Elbridge Bryant. While on tour as part of the Motortown Revue, a collective tour for most of the Motown roster, Smokey Robinson caught the Temptations' part of the show. The group had included a medley of soul standards in the show, one of which, the Drifters' "Under the Boardwalk", was a solo spot for Ruffin. Impressed, Robinson decided to produce a single with Ruffin singing lead. Robinson saw Ruffin as a "sleeping giant" in the group with a unique voice that was "mellow" yet "gruff". Robinson thought that if he could write just the perfect song for Ruffin's voice, then he could have a smash hit. The song was to be something that Ruffin could "belt out" yet something that was also "melodic and sweet". After some persuasion from Ruffin's bandmates, Robinson had the Temptations record "My Girl" instead of the Miracles, who were originally to record the song, and recruited Ruffin to sing the lead vocals. According to Robinson, he allowed the group to create their own background vocals "because they were so great at background vocals". [This quote needs a citation] The signature guitar riff heard during the introduction and under the verses was played by Robert White of the Funk Brothers. This part can be heard without vocals on the 2004 deluxe edition of the soundtrack from the 2002 documentary Standing in the Shadows of Motown. "My Girl" was later sampled for "Stay," a single from the Temptations' 1998 album Phoenix Rising. The single was re-released in 1992, following the November 1991 release of the film of the same name, which featured the song. It did not reach the Billboard charts, but did reach number two in the UK Singles Chart. "My Girl" climbed to the top of the U.S. pop charts after its Christmas time 1964 release, making it the Temptations' first number-one hit. The single was also the first number-one hit on the reinstated Billboard R&B Singles chart, which had gone on a fifteen-month hiatus from 1963 to 1965. The single also gave the Gordy label its first number one on the Hot 100. The Temptations were the first Motown act to earn a Grammy. In 2004, "My Girl" was ranked number 88 on Rolling Stone's list of "The 500 Greatest Songs of All Time". In 1965, Otis Redding brought a traditional blues flavor to the song. Produced by Steve Cropper, it was released on Redding's album Otis Blue: Otis Redding Sings Soul. His version was not released as a single in the US, but Atlantic issued it in the UK to capitalize on the relative lack of success by the Temptations' original version, and Redding's cover eventually peaked at number 11. In 1988, Suave had a Top 40 Pop hit and Top 10 R&B hit with the song. R&B/soul group the Whispers covered the song in a disco style for their eponymous 1979 album. It was subsequently released as a single, and (despite missing the US Charts completely) was a Top 30 hit in the UK, reaching number 26. ^ "National Recording Registry Reaches 500". Library of Congress. March 21, 2018. Retrieved March 21, 2018. ^ a b c Blair, Elizabeth. "My Girl". NPR. Retrieved 2009-06-24. ^ Whitburn, Joel (2004). Top R&B/Hip-Hop Singles: 1942–2004. Record Research. p. 803. ^ Bronson, Fred (Nov 7, 1998). "The Temptations". Billboard – the International Newsweekly of Music, Video and Home Entertainment. 110 (45): 26. ^ Zimmerman, Lee (Mar 2015). "THE DARK SIDE OF MOTOWN". Goldmine. 41 (3): 42–44, 46. ^ "The Rolling Stone 500 Greatest Songs of All Time". Rolling Stone. Retrieved 2007-03-07. ^ "Item Display - RPM - Library and Archives Canada". Collectionscanada.gc.ca. 1965-03-01. Retrieved 2018-07-09. ^ "The Irish Charts – Search Results – My Girl". Irish Singles Chart. Retrieved July 12, 2018.